Discover the benefits these two types of insights can offer. Customize how other people see you in public and in organization between colleagues. Change type of sound for notifications, messages and requests. First, go to top right corner click and click on your account name or photo and choose Settings. 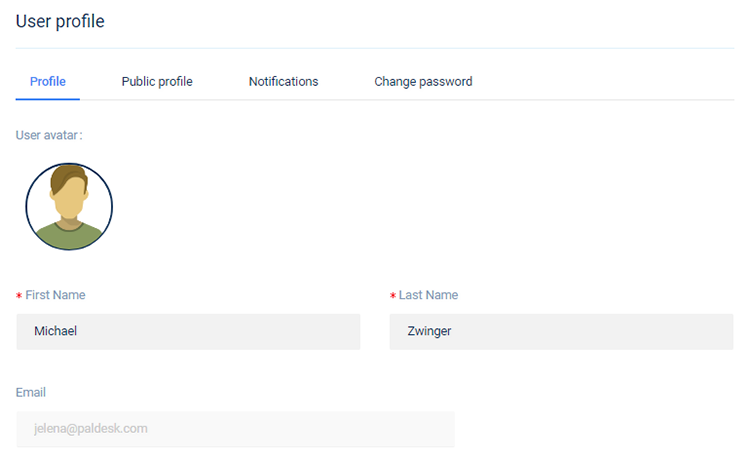 User profile contains 4 tabs – Profile, Public profile, Notifications and Change password. Profile – how your team members see you inside organization. User avatar can be uploaded from your computer or search on Internet for desired photo. Notifications – in this tab change sound type, volume of message notifications and client request notifications. You can also enable or disable option to get notifications about new message on your email. Don’t want notifications about ticket reassign or new messages? You can turn it on/off anytime. Change password – enter your old password and then enter the new password. Comfirm it.